At the age of seventy I retired from university and hospital practice: it was clearly time to realign mind and body to manage the inevitabilities of aging. I needed a personalized fitness experience to meet me where I was, get me back in shape, and support my confidence to do so. 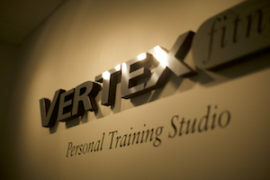 I found it all at Vertex Fitness. Dwayne Wimmer’s highly effective evidence-based personal training approach began with an in depth interview gathering health and wellness data to develop my individually tailored goals. This free initial meeting set the foundation for our working relationship. Dwayne understands and impeccably demonstrates that training for personal fitness demands ongoing education and a quiet, focused environment to support challenging exercise. I started on his total body workout program in the quiet and spacious Vertex studio. Within weeks I began to better identify, isolate and strengthen underutilized muscle groups, while learning how over the years I had inadequately compensated for old injuries. Dwayne’s calm, expert encouragement has me significantly stronger, better balanced, healthy and very optimistic about my future health and strength. I look forward to continuing and increasing this powerful work with Dwayne and his team. It is truly transformative.